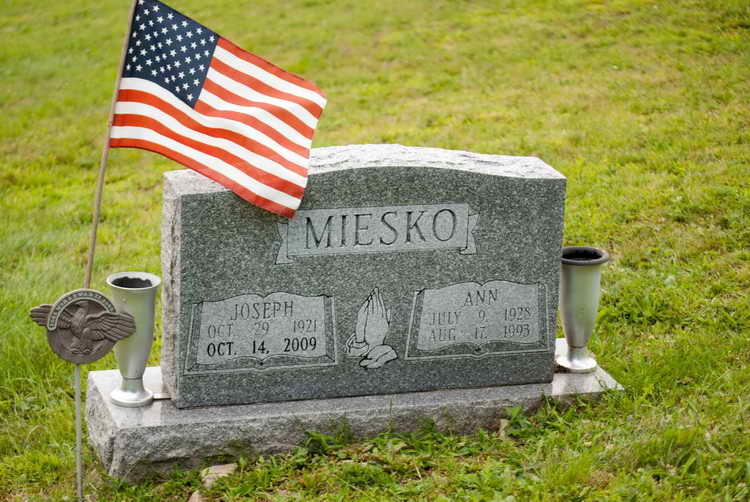 MIESKO – Joseph M. "Midjo," 87, [of] Lilly [PA], went to his eternal rest Oct. 14, 2009, at Altoona Regional Health. Born Oct. 29, 1921, in Lilly, son of the late Joseph and Frances (Siedlarczyk) Miesko. Preceded in death by wife, Ann (Sisto) Miesko, and numerous brothers and sisters. Father of Linda Miesko, Lilly; Joseph and Peggy (Schrier) Miesko, Johnstown; and Thomas Miesko, and friend, Sally, Lilly. Also survived by grandchildren, Lindsay, Katie, Kelly, Torrie and Mitchell Miesko. Midjo was a retired coal miner. Friends received from 2 to 4 and 6 to 8 p.m. Friday at Thomas F. Cloherty Funeral Home, Lilly, where funeral service will be held at 10 a.m. Saturday, by Pastor Adam Krazets. Committal, Our Lady of Mount Carmel Cemetery, Lilly. Military graveside rites by Lilly American Legion and Lilly VFW. Grave marker for Joseph M. Miesko in Our Lady Of Mount Carmel Cemetery, Lilly (Cambria county), Pennsylvania. Joseph enlisted in the Army at Altoona, PA on 7 September 1942. On 29 September 1944 Pvt Miesko was transferred from the 82nd Airborne HQ to Service Company, 508th PIR. Pvt Miesko was wounded in action in Belgium on 26 December 1944. Promoted to Pfc on 4 January 1945, he remained in the hospital for more than 6 weeks and returned to the unit on 18 February 1945.